Who knew that an afternoon ride today would be so interesting? I waited until it was as warm as it was going to get … 39° F with gusty westerly winds. I planned a ride to the southern end of the trail and return, just not having that much enthusiasm for a ride. Within the first 5 miles, I decided to ride THE WALL for the first time in 2011. I wound my way down to the bottom of the hill, considering a photo from the bottom of the hill (in order to keep my promise about more photos). When I arrived at the bottom, I could see that there was just no way to capture all of the hill, and I wasn’t about to stop part way up for a series of photos. I dropped into the granny gear and pounded my way up the hill. Yes, it was tough, my heart rate spiking to 175 with the effort, but I made it to the top in better shape than any of the other times. It was a nice addition to my ride. 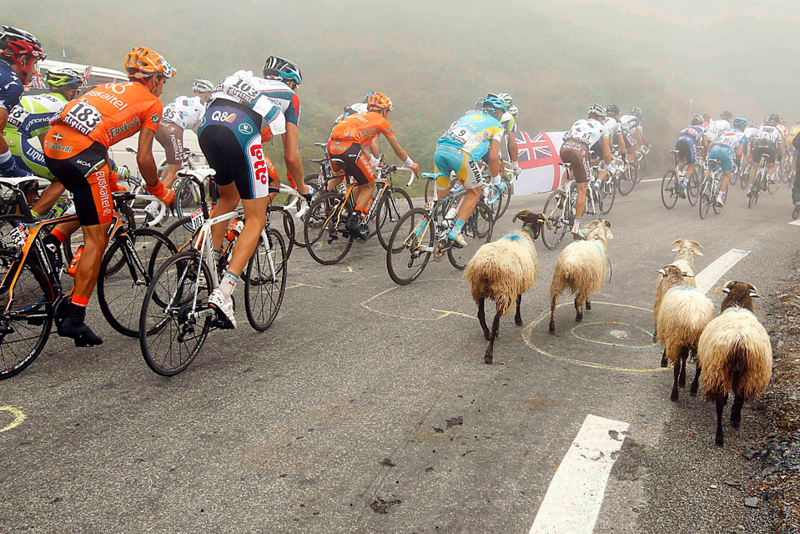 Well, cut the road in half, take out all the other cyclists, eliminate the fog, and turn the sheep into fat goats, and then you have what I encountered. There were 5 goats on the trail, terrified of that red object bearing down on them. I felt like a goat herder as they dashed down the trail, then dove into the brambles on the west side of the trail, back toward their pasture. I don’t know what I would have done had one decided to halt, turn around, and confront me. After that, the work crews on the trail and the high school students wandering down the trail with their iPods blazing completely unaware of their surroundings, seemed rather mundane. Time to start looking for a helmet cam to capture the unexpected.